Address: 1061 Budapest, Paulay Ede u. 31. Winner of the 2018 Hotel of The Year Award, this boutique hotel is a hidden gem located in the downtown of Budapest, with 25 uniquely designed and spacious rooms, wellness facilities, a generous buffet breakfast and mindful personal service. 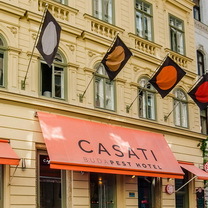 CASATI Budapest Hotel is one of the oldest buildings in Terezvaros, the ancient historical district of Budapest. Located on Paulay Ede street, it offers the guests a high level of comfort and personalized service that is simply unavailable in today"s standardised hotel-chains. The unique approach coupled with meticulous preservation efforts and presentation of old values created a unique establishment offering a combination of individuality and comfort fused into elegance. Over 150 years of the city"s history including a piece of its sophisticated musical, theatrical and business district, are hidden within the walls of the hotel. The original 18th century walls, along with the ancient wells that have been lovingly restored to their original splendor, are visible on the ground floor and the cellars and impart a magical and unique charm to the facility. This combination of heritage and modern style makes it a desirable choice for both the business and the leisure traveler, who feel tremendously welcome and experience a most enjoyable stay. The hotel staff is convinced that these values hold great appeal to a demanding clientele and create a peaceful retreat in a hectic world. It is their desire to make the place a home away from home, a place to which you would always be happy to return. Most of Budapest"s main sights are within walking distance, - the Opera, Saint Stephen"s basilica, the Synagogue, the theatres of "Pesti Broadway", Andrassy street and the cafes and restaurants of Liszt Ferenc square. The downtown pedestrian areas and the business district are all an easy five to ten-minute walk. The underground station is only two minutes on foot, making the more distant points of Budapest also easily accessible. There are 25 spacious and quiet rooms, most of them air-conditioned and fitted with specially crafted furniture, making each room unique in its own way. The rooms are styled to reflect the warmth and intimacy of your own home. All rooms are discreetly equipped and feature all the comforts of an elegant hotel. All rooms are en-suite, including a shower or bath with a minibar, remote-control satellite television, and Internet connection. With its new exhibition facility, the glass-covered inner courtyard, its inviting domed cellar and its special event rooms, Hotel Casati is the ideal place for podium nights, business meetings and friendly get-togethers, especially for those who demand more than just "a place like home". The three, domed event rooms in the cellar are the perfect location for private events. The hotel can provide full technical equipment upon request.